Note: This is the second of a three-part series on our work on ApplyHouston, please click here for Part I. For a PDF version of this case study, click here. In Houston, there are over 130 charter schools. Each district has its own application process and deadlines – some even have separate application processes for each campus. In addition, inter- and intra-district transfers, magnet schools, and private schools all have their own deadlines and processes. In other words: a chaotic system, favoring parents with the most time and resources. A ground-breaking shared school application for the nation’s fourth-largest city required a robust marketing and communications effort. Families Empowered collaborated with its school partners in this work, leading the effort with high-quality digital and printed collateral, an engaging mobile-friendly website to host the application, and a public relations campaign which earned several media appearances. To help parents with the new application process, especially for those with limited access to technology, Families Empowered’s bilingual staff worked hosted “Application Nights” events and two large school fairs. The initial launch of AppyHouston was generally smooth, but, as might be expected, there were a few technical snags in the first months, such as some parents having difficulty logging in. ApplyHouston’s developer, School Mint, was quite responsive in addressing and resolving these difficulties. 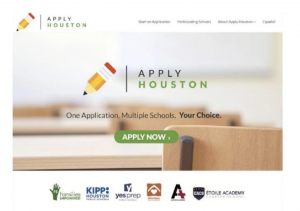 Upon reflection, some school partners wished they had spent more time coordinating their own individual marketing efforts with ApplyHouston, and taking better advantage of the opportunity for collaboration with other networks. In addition, some of the smaller and new school partners found that some families applied to their school without knowing much about it, but they did appreciate the opportunity to start a conversation with those parents. All school partners are signing on to use the system next year, so there will be another opportunity for collective planning and coordination. Was it all worth it? 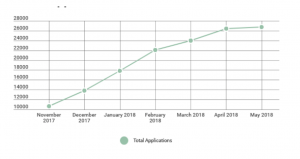 The initial results speak for themselves – as of May 4, 2018 ApplyHouston received 26,679 applications in its first year, an overall increase from the previous application season. To put this number in context, the Denver shared application and enrollment system, which has been around for seven years and currently includes over 200 schools, received 23,111 applications this past year.4 In other words – this is phenomenal success for the project’s first year, and there is definitely room for growth in future years as more school partners join the project. What Families Empowered is most proud to announce is that 4,460 parents (23%) applied to multiple schools, compared to around 6% in previous years. The organization sees this as a sign that Houston parents are better able to navigate the system, and take advantage of choices that are available to them. In other words: empowerment! 1 For networks which provided data to Families Empowered on the number of applications they received during the 2016-17 enrollment season (the vast majority of applications were from networks where Families Empowered has access to baseline data). The change from the baseline year was a 6% overall increase in applications.